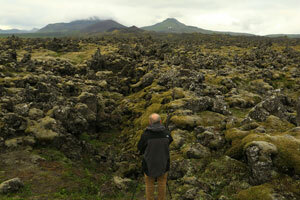 "That's Iceland"...It's something I find myself saying all the time when I'm here. It could be to describe something amazing like a never ending light show, and I also use it to describe situations when the conditions go from bad to worse to bad and then to acceptable in less than an hour. Weather here can literally be windy and raining on one stretch of landscape, and be amazingly beautiful and serene only a 10 minute drive away. It's part of the allure that bring people to visit this amazing country. They want to see this volatile and beautiful weather and see it with some of the worlds most memorable and rugged landscapes. Towering waterfalls, jet black sand beaches dotted with shards of a frozen glacier, and hills that comprise every shade of green imaginable (even the neon ones) It's all here just waiting to be explored and photographed. I've been coming to this magnificent country for 5 years, and don't see a time I will not want to experience the beauty it has to offer, and share it with others. 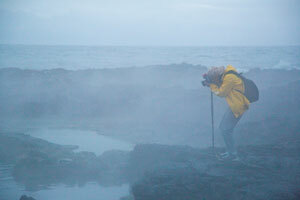 A small group of four gritty photographers meet me in Reykjavik. The weather has subsided somewhat from the downpour that separated my first group from this one…and we're hopeful that despite some clouds on the forecast we will be able to find something to photograph on our first evening. After a great fish dinner our group sets out to the Blue Lagoon. 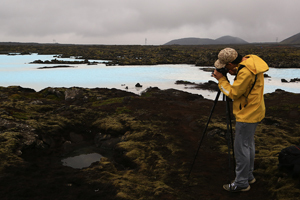 Geothermal runoff from a nearby power plant has left a vibrant blue water that snakes and winds through a coal black lava field. It's truly stunning to see and to photograph. 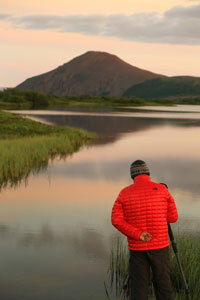 I help our group pick their lenses, and get started looking for some memorable shots. A dark sky hangs over the land, and I really try to help people find the simple things here that showcase this great juxtaposition of color and texture. The mossy green lava rocks, with small pockets of pink flowers, and a vein of blue water winding between makes for some memorable shots. Heck, even shots of the power plant in the background, the source for this magic can make for some interesting photojournalistic style photos. We make the most of what mother nature throws at us, and after an hour of shooting we are sent packing when the mist increases to a drizzle. 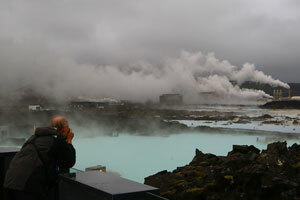 Thankfully, Iceland is forgiving and a small drive brings us to another geothermal area where the outpour of heated water explodes into the sea creating a dynamic mix of steam, rock, and color. 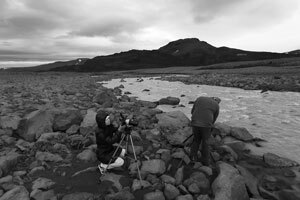 We carefully maneuver the rocky coastline, and I help the class with compositional ideas, filter use, and different ways to see the seen. It's a lot of fun, and everyone comes away with some crazy shots. Our last stop is kind of unexpected. I saw some great steam rising from some nearby geothermal vents, and a nearby lighthouse looked great towering out of the steam. I thought it would be a great opportunity for some telephoto compression…but when we arrived at Gunnuvar I noticed the really great shot was an old broken boardwalk sitting in front of several layers of hillsides, surrounded by different levels of steam from the vent….creating very eerie outlines of all these shapes within a fog. 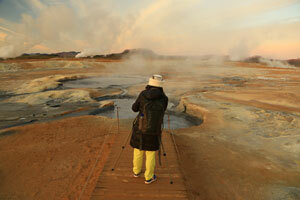 We set up shop here and captured some non typical Icelanic landscape images. We experimented with different shutter speeds to blur the steam, or capture some with more detail in it…and discussed the great opportunity here for creating some composite images with different steam textures. 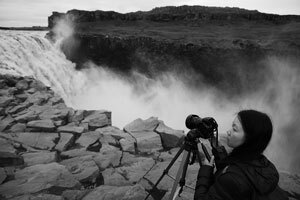 It was a great unplanned find, and one I was really happy the class could shoot…also someplace never before visited on a Iceland tour. 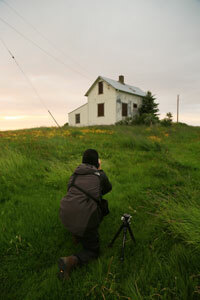 Though the rain was constantly chasing us, we managed to squeeze in 4-5 hours of good photography on our first night. That's Iceland! 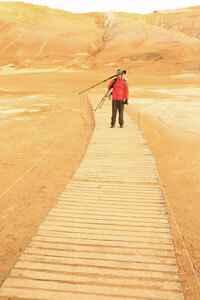 Off we head towards Jokulsarlon, the glacier lagoon. After a long drive in our trusty van we arrive at the freshly remodeled Fosshotel Vatnajokull. This stellar hotel was JUST reopened a week earlier, and everyone was treated to a sweet newly remodeled room. 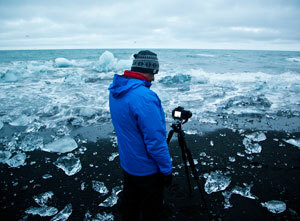 Weather was still dicey, but we made the best of our first night by shooting ice on the black sand beach near Jokulsarlon. Giant chunks of ice wash ashore after being deposited into the nearby bay by the mighty vatnajokull glacier. 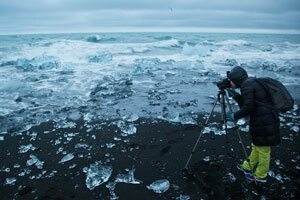 Though the light was moody, we still covered all the topics necessary to capture ice on the beach with moving sea water. Though we had some moody light our first days I was determined to try and find the good light wherever it was located. 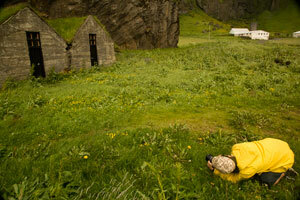 On our third night we made a long drive to the town of Vik, where we were treated to much better conditions. 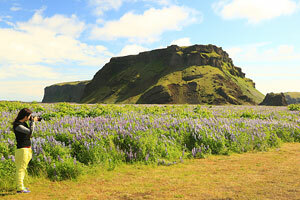 We made stops at the iconic red roofed church, surrounded by fields of purple lupine. Once there I offered compassion suggestion and some tips on perhaps upping the ISO to get fast shutter speeds so the flowers wouldn't move in the image. 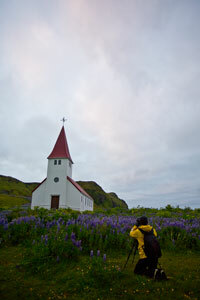 From there we moved up a hill to get a shot of the church surrounded by fields of different shades of green, as well as a nice purple lupine stripe…it was a great way to dust off those large lenses and get some telephoto shooting in. 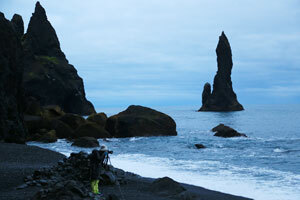 Our next stop was the black sand beach at Dryholey. 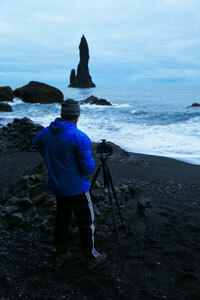 This little pocket of sand is one of my favorite for shooting a portion of the iconic sea stacks Reynisdragnar. We walked to the end of the beach and used some rocks there as foreground for getting some moving water contrast with the black sand beach. 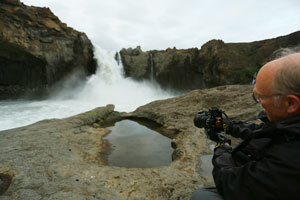 IT took some work but everyone got some nice moving wear shots along this stretch of coast. After another stop at the church to photograph it lit up we moved onwards…it was getting early in the morning but the light was just perfect so we made a stop at a few roadside reflections so people could get some of the mornings cool cloud color and a nice bank of low fog ebbing through the hills. 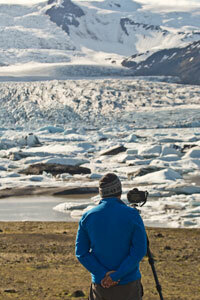 On our way home we also made a morning stop at the iceberg beach near the Jokulsarlon glacier lagoon. A soft subdued light was on the horizon and there were numerous chunks of ice floating in the sea, and stranded on the black sand beach. 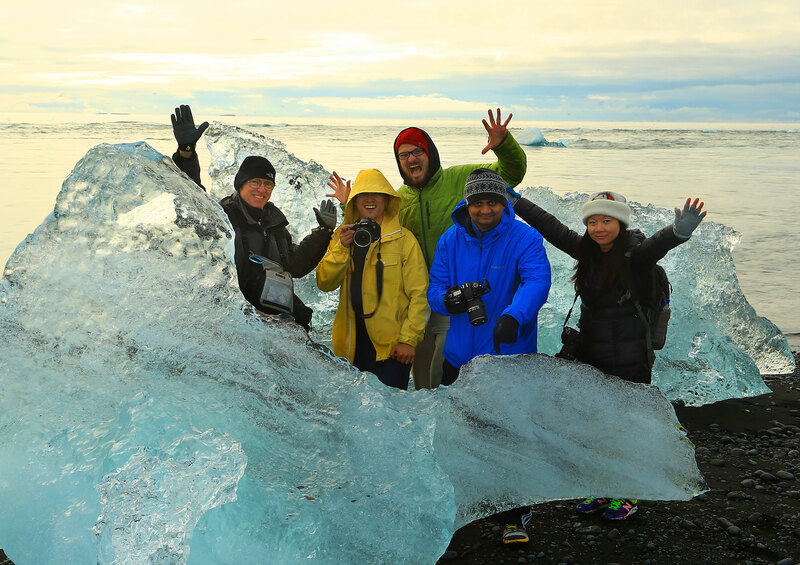 The group had a GREAT time working compositions with select icebergs, and also some using a large variety of ice within the frame. 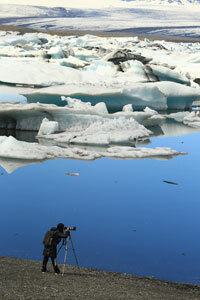 In addition to the shots of icebergs from afar, there were also numerous shots of close up more abstract images as well. There was SO much to shoot. By the time we reached our hotel it was well after 8am. This was the new record for my groups in terms of time we returned to the hotel. What a great night of photography! 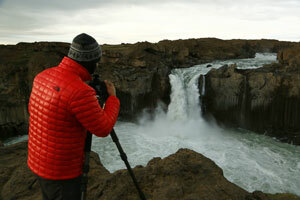 Today we moved back to the west to hit up some of the country's bigger and most iconic waterfalls. Along the way we made a stop at the glacier lagoon to get some better light. Though two days of drizzle had obscured the mountains and glaciers the first 2 times, a blue sky and white clouds greeted us on this afternoon. 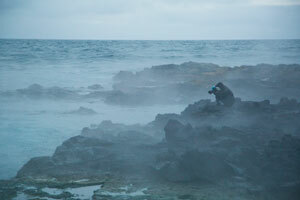 While two members of the group went on a zodiac tour of the lagoon the rest of us shot the lagoon. Even though a colorful sunset is what most photographers prefer here, there's something very aesthetic about the blue and white combinations with the ice and sky. 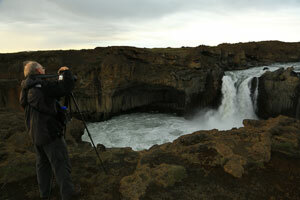 That night we shot an amazing sundown at the waterfall Seljalandsfoss. 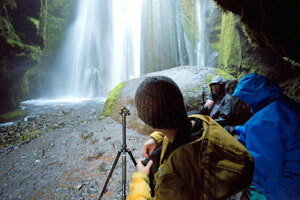 This waterfalls is known for being able to walk behind it to shoot the waterfall looking out. We had a good sunset so there was a chance to get some warm light on the falls, and also a sunstar…which we achieve by using a higher aperture. From Seljandsfoss we go just up the road to the waterfall Gljúfurárfoss. This waterfall requires a small walk up a stream into a cave where the falls drops…there you move far to the right and then you're out of the mist zone, and able to shoot this crazy cave waterfall. 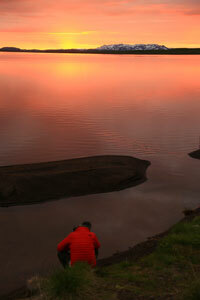 After a long drive to the north of Iceland we take up residence at a beautifully run horse ranch, Skjaldarvik. 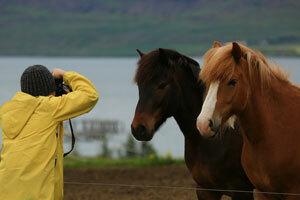 Here our group has free reign over the fields to shoot the many icelandic horses here. 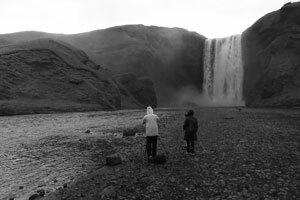 After a brief rest we head to our primary destination for the night Godafoss. This horseshoe shaped waterfall treated us with some epic light, and everyone came away with a multitude of great images of this green-blue waterfall and a intense sunset. 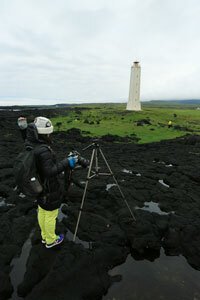 I helped people try out different compositional ideas, and make the best of this amazing light show Grad filters here were a big help balancing out that sky with the darker volcanic rock. 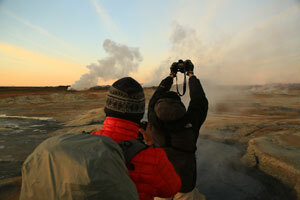 Trying to make the most of the nice light we moved on to the Namaskard geothermal zone, where the group spread out over this alien steam-vented landscape to photograph the wild colors and bubbling pools of sulphur with some great sky colors. I saw some really nice images here, and a few takes on the location I had not seen before….great job by everyone! After a long night, it was back to the hotel for some much earned rest. 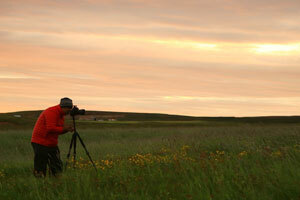 The weather looked quite dreadful everywhere except one small pocket of the country, and luckily for us we found it. 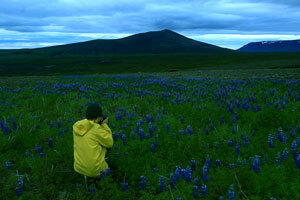 We drove to the tiny fishing town of Husavik. 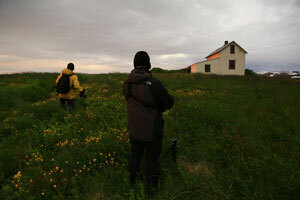 This town formally known for whaling has now become a eco friendly whale site seeing tour town…outside of town we found a small fishing cottage and a field of lupine that we were able to use with a stunning sunset for some really nice image. These images were made sweeter knowing there was rain falling on 97% of the country at that time. Tonight We sat out for a few more epic waterfalls. 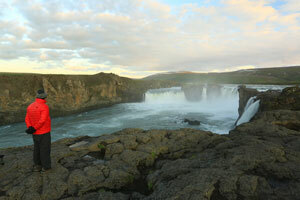 Our first stop was the rugged and remote Aldeyjarfoss. 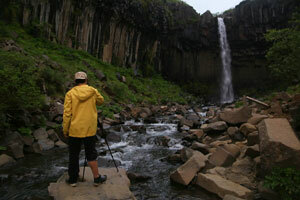 This waterfall sits in a steep canyon of basalt, formed many years ago by erupting volcanoes. 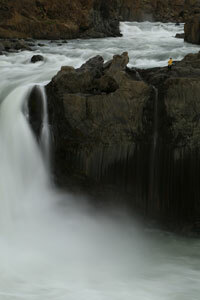 This waterfall is one of my personal favorites in the country. It just feels like another planet here. The class lined the edge of the cliff and all got some shots of the grander view of this amazing location before spreading out and shooting the falls from the side, and even below, where a nice pool of water in a rock reflected some hints of pink from a break in the clouds revealing the nights sunset. 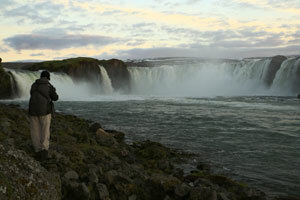 Our next stop was the mighty Dettifoss. Also known as Dental Floss by our group. This is the most powerful waterfall in Europe, and when you stand at the edge of it, you can FEEL the power as tons of water flow over this basalt shelf into a deep canyon below. The roar alone is deafening. 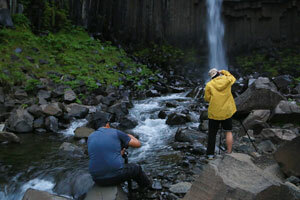 The group shot from far and close as they tried to capture the power of this mighty waterfall in a single image. I find this waterfall looks best in black and white, and we had plenty of definition in the sky to help make sure those conversions would be awesome when they got home to process. On the way home our van began to lose power going up hills…and we hoped to make it home…but as luck would have it on the VERY last hill before the downhill decent in to Akureyri and our hotel, the van overheated and came to a halt…100 yards shy of victory. A quick call to the rental company and a cab was on the way to pick up the group and take them to the hotel while I waited for the tow truck with the van. Despite losing a member of our team, if a van can be considered a team member…we only lost 1 hour of time off our schedule and a replacement vehicle arrived at our hotel. 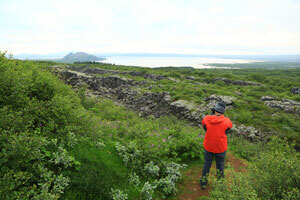 We loaded up and made our way for the tiny farm town of Reykholt. Everyone was in need of some good sleep, after a long few days, and we decided to make it a short night and visit the nearby Huranafossar, a series of small waterfalls cascading over a shelf into a river. SO many little details here, people really had a fun time trying to make appealing compositions given SO many waterfalls…and everyone got some really nice shots. Given our new ride was a 4x4 we decided to take it for a little spin on a nearby dirt track into the interior. Though we didn't venture far we did find some rugged and remote landscapes, and all noticed how the temperature dropped once we exited the car. 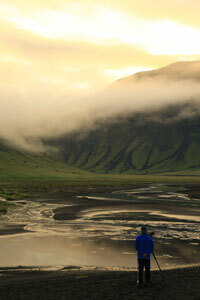 In addition to the remote feeling of the interior of Iceland, I really love the silence. Iceland is pretty quiet in general, but the interior takes it to a new level, and you can actually hear the wind slipping past each craggy peak. The light was dark and eerie, but we shot a little anyway and ended up turning a short night into one that ended about 2am. Our final stop for the night was Kirkjufell, this axe blade shaped mountain sits alone in a small harbor just outside Grundarfjordur. A waterfall aptly named Kirkjufellafoss sits across the street and makes for a very nice foreground for shooting this photogenic peak. The wind was whipping pretty nice, so reflections were out of the question but the mountain was ready for its photos to be made, so we obliged. 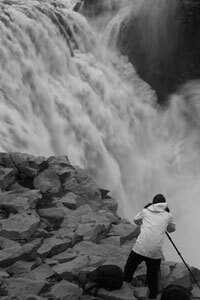 Some people even opted to work on some nice slow shutter images of just the falls and sections of it. Really good stuff all around. Our last day. On our way out of Snaefellsness we stopped at the sea stacks of Londragnar, these oddly shaped rocks sit on top of a maze of different shelves of lava. The surrounding cliffs are home to a couple breeds of nesting birds, and everyone had fun using their longer lenses to try and capture some of the noisy nesters as they flew to and fro bringing food and supplies to the nest. After a final meal together we set out for the final shoot. 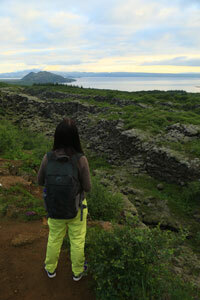 Our first stop was Tingvillir National Park We made a stop above the canyon overlooking this natural wonder. This area in addition to being a big part of Icelandic History is also the location where the North American and European tectonic plates are separating. It's like a big indentation in the earth filled with vibrant green foliage. Next we stopped at the little town of Geysir, where you guessed it there was a geyser waiting to be photographed, and also where the word geyser originated. 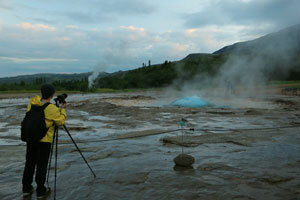 The only geyser here the erupts now is Strokkur, this geyser goes off every 5-7 minutes and is a lot of fun to try and capture in action. 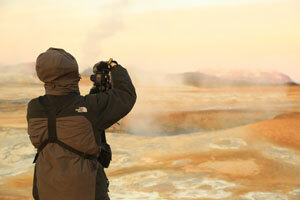 We change our camera settings, set for fast shutter shooting, bump up those ISOs and get a faster shutter speed so when the blue bubble bursts and the geyser explodes we've captured the whole process from start to finish. This group was dialed in and it only took two eruptions before everyone had captured it…and only 2 more before they'd all captured it vertically and horizontally. After a little more time exploring some of the other geothermal pools in the area we moved on to Gulfoss…or Golden Waterfall. 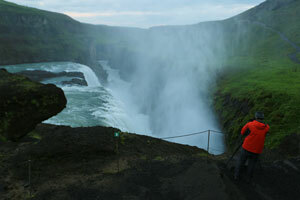 This mighty waterfall is one of the most visited in the country…and we had it all to ourselves. 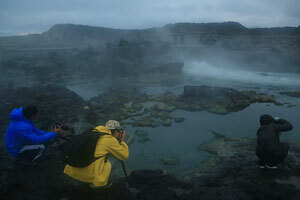 We shot the typical far back view, and moved through the mist to the side to look at this giant from the back. Robert even went to the top to get a birds eye view of the waterfall from above. By this point everyone was really dialed in with settings, and able to start picking out their compositions and move through a scene with purpose…they'd come to see the best Iceland could give them, and dealt with a variety of subjects, and lighting….and now they'd emerged from the trial seasoned veterans to shooting these subjects, and living the life of a sleep deprived landscape photographer. As we drove back to the hotel, everyone took one last opportunity to nap in the car…they'd earned it. With all the images they have compiled over 10 days of shooting, I think after they process them all…they'll need an even longer one. A big thanks to Robert, Vivien, Shiva, and Hank…thank you for being a terrific group of determined, easy going, photographers who were up for every challenge and handled them all brilliantly. Brian and the rest of the Aperture Academy team!